Lombok, which has a lot of activities and attractions for every traveler, is one the last best-kept secrets of Indonesia. 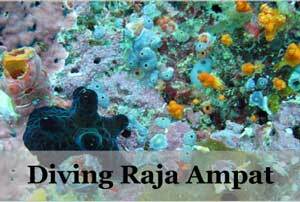 It is the alternative to Bali, also known as the Bali before the commercialization. With weather that is almost perfect all year round and beautiful pristine beaches, you will find that paradise does indeed exist in the backyard of Bali, Indonesia. 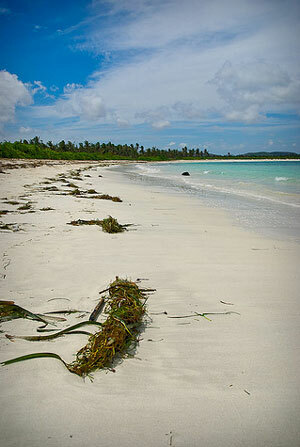 The beach is dotted with powdery white sands while the sea filled with astonishing blue corals and marine life. The land boasts its own richness with Mount Rinjani standing majestically as yet another volcano mountain of Indonesia while the countryside boasts forests and wildlife besides villages of people and culture. 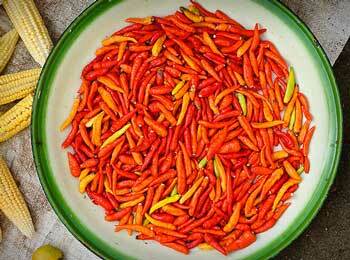 Lombok itself meant Chili Pepper, and what more than to pay homage to its name and give yourself a taste of it. Be careful you might get burn but it is worth it as it comes in a form of sambal that unsurprisingly the locals know well to make it dangerously delicious. Sambal is a spicy condiment that you may dip with most of your local Indonesian food or it may be also cooked into some dishes already like curry or grilled meat. 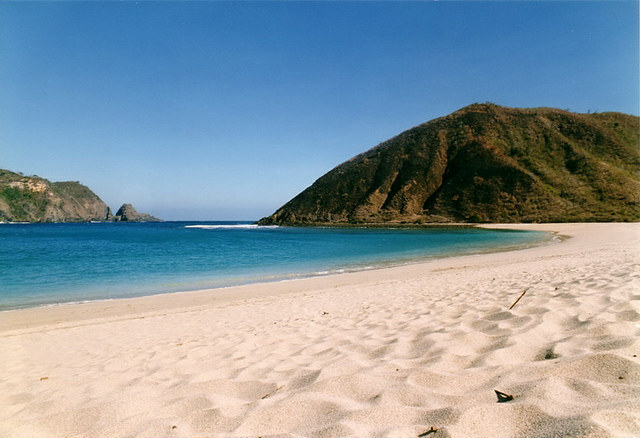 Lie down on soft powdery white sand and while the world away in one of the many almost secluded beaches of Lombok. The most famous beach is the Kuta Beach and Tanjung Aan in the South of Lombok which many believe are more beautiful because of its remoteness. 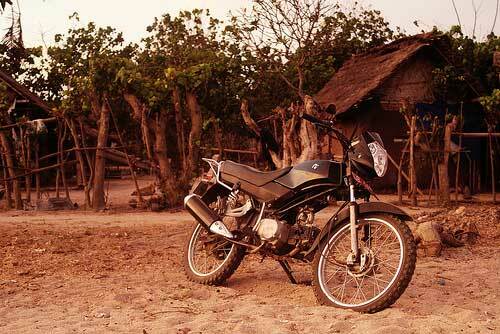 But at the other parts of Lombok, you may also find lesser known but the rural beach that could just be a hidden gem. If you have the time sail off to the tiny islands of Gili Islands just west of Lombok for your exclusive beach hang out. 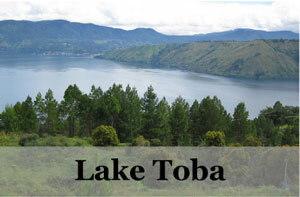 Inside and around Lombok, it has many sightseeing and attractions that would satisfy any curious traveler. Rent a motorcycle and put on your explorer helmet around Lombok, this is one of the best ways as the public transport is unreliable while you have the total freedom of doing whatever you like without needing to wait and stress about haggling price every time. Lombok is relatively small and can be explored in a day, the ride across the 21km coastal stretch from Senggigi to Pemenang are notably beautiful while the other smaller inner roads will bring you to secluded waterfalls and vast rice paddy fields. 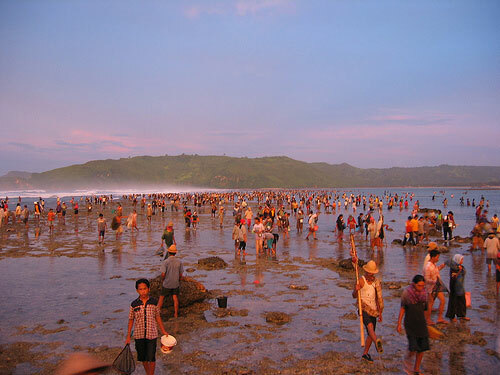 In February or March every year, hundreds of people will rush to Lombok to catch a glimpse of the first nyale (worm-like fish) at this huge fishing festival. Join in the crowd and look for your first nyale, and if you are brave enough eat them as well. The indigenous Sasak people of Lombok will commemorate a mythical princess who drowns in these waters to escape a politically arranged marriage. This festival is done the same time with the season of these worm-like fish, where they are caught and eaten roasted in banana leaves with much enthusiasm. At 3626m, Rinjani is the second highest volcano in Indonesia and one of the most famous ones for travelers, side by side with the likes of Mount Bromo. 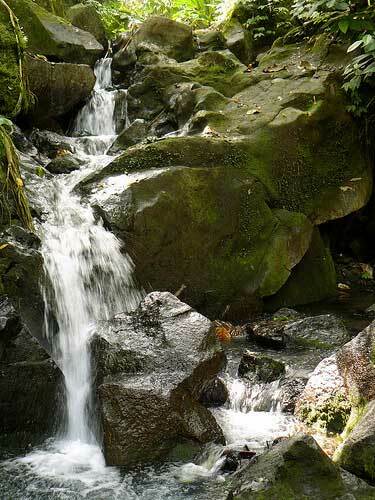 It is due to its beauty and also because it was doable for most experienced hikers and easy for the strong minded. At 2,700m, you may already soak in the beautiful crater lake view but with another 1,000 ascent that requires extra physical and mental strength, you may conquer just yet a truly awe inspiring volcano of the world. 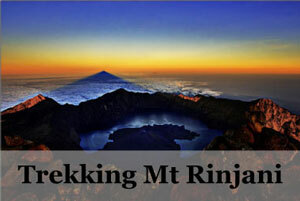 One’s stay in Lombok would not be complete without conquering Mount Rinjani. 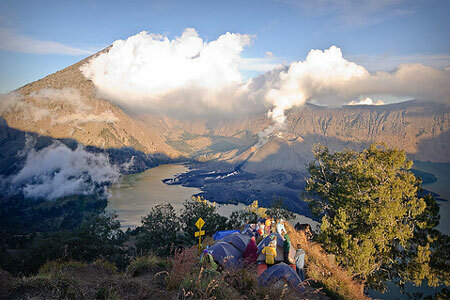 A guide or hiking tour up Mount Rinjani is much recommended for safety. Stay in one of the many homestays here or just mingle with the local villagers to experience the unique way of life here. 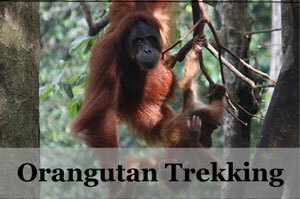 Also, visit local villages like the Senaru Village and do your very own walking tour around. Here you will learn about the history of Mount Rinjani and the surrounding, bringing in more meaning and appreciation to what you experience in Lombok. Deep in Senaru Village, if you explore enough you may find hidden waterfalls such as Air Terjun Sindang Gila (slightly crazy waterfalls) which is the most famous among the rest for being breathtakingly beautiful with waterfall as high as 50 m but if you want to have a peaceful dip, you may try Air Terjun Tiu Kelep which has a nice bathing pool below the smaller falls. Here you may get the local Sasak people to give their traditional massage, mainly you may find them in tourist areas such as Senggigi Beach or Mangsit. These massages are therapeutic for the body and also the mind as you get to be massaged with a background of the music of the waves on the beachside. You may find weaving villages that produce many beautiful tapestry, here you can see how they are made. 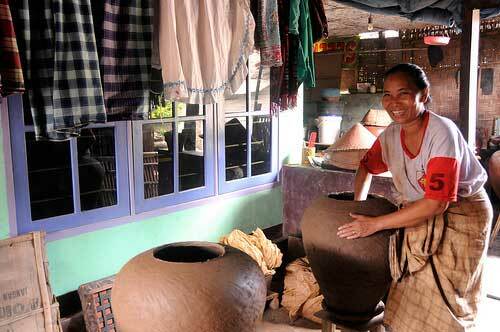 Or go to pottery making in some other villages and marvel at their beautiful work of arts on handmade pottery. You may do a shopping or two for souvenirs in these villages to support the local community. Surrounded by the beautiful deep blue sea that apparently houses those deeply blue corals, it is almost impossible not to do snorkeling here. Take a boat out and snorkel in many of the beautiful spots around Lombok. If all these still have not satiate your appetite and you are still thinking about what else to do in Lombok, head to the nearest secret islands – Gili Islands. And if you find that we have missed out some of the top best things to do in Lombok do leave a comment, we would love to hear from you! Agoda.com is another good choice for me because they have the most extensive hotel listings in Asia. Most people stay around Senggigi beach area in Lombok, with its variety of accommodation choices as well as restaurants. Another choice would be to stay at Mangsit beach, where there are many choices in from mid-range to budget. If you want to go for more hype than the upcoming place is Kuta, Lombok. Planing to go to lombok from bali, with 2 kids (8 & 6 yrs) whre to go with the kids its it suitable with to go to the lake (ranjani or waterfall)? What will be your advice compare Yogjakarta and Lombok? 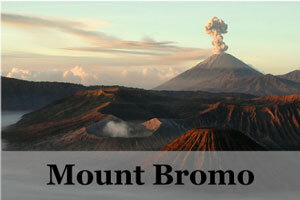 yogyakarta would be more to city and visiting the ancient temples of Borobudur and Prambanan. While Lombok is an island for the beaches, sun and sea. I can’t decide between staying at the reef gili meno or villa ombak gili Trawangan? 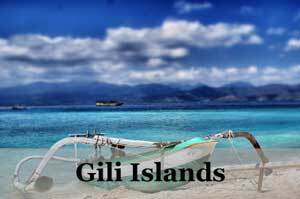 is gili meno closer to the surf? We are a group of 6 women travelling together arriving Denpasar on nov. 2 – 16 2014. 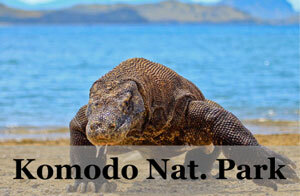 What would be the best way of visiting TANJUNG, SEMARAG,SURBAYA,CELUBAN,AND KOMODO. Should we stay in Bali and visit around? Is there enough to visit. Would you recommend any travel agencies for Mt. Rinjani? Also, is it possible to do a day trip up the mountain or will I have to do a 2D1N min. Hi Peishan, yes you can do a day trip but that is only to visit the crater rim and not to the summit. If you want to truly experience Mt Rinjani, I would recommend doing the 3 days 2 Nights hike up to the summit because it can be too difficult to do it in 2D1N. when the fes is at lombok a lot of people bring food. Hi Rachel when we go on my 20th birthday at lombok and bali . At bali we will go to the Bratan temple the tree house is at the top of the temple then . We go to lombok Indonesia than that is MT Ringani and we go to sengiggi and than we climb Rinjani and we find lake segara Anak . What will be your advise compare Lombok n Bali??? At the same time we planning to go to both places.